Bowmanhirst is a property in the parish of Carluke, associated with Brownlee House , which in 1750 had become the home of William Harvie. In 2004 it was still occupied by Harvies. The relationship between this Harvie family and John Harvie and his descendants is unclear, though it is probable there was a family relationship as properties Bowenhirst, and Topenhill. 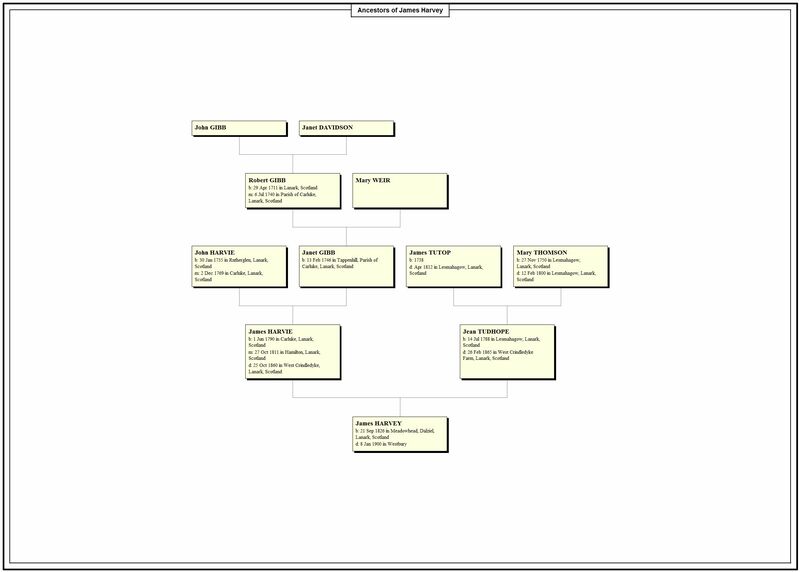 (E5 on the map) appear in public records and other documents related to Brownlee Estate when tracing John Harvie and Janet Gibb’s family. 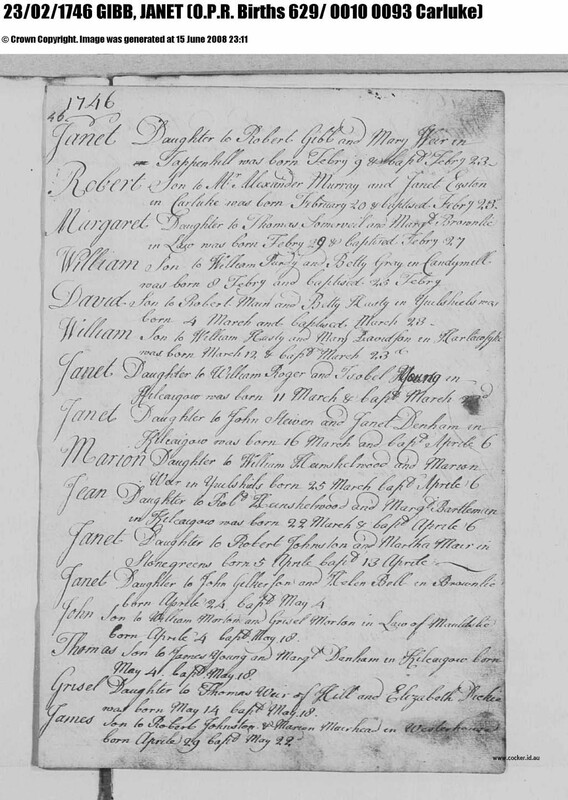 Janet’s birth in 1746 is recorded as “Tapenhill”, so possibly John Harvie married the daughter of a tenant farmer of Brownlee Estate. The Gibbs were at Topenhall for at least 40 years (given Janet was born there as well as her daughter Mary in 1786). John’s family is not specifically referred to in Dr Rankin’s History of the Carluke parish, which reports the properties associated with William Harvie’s family. 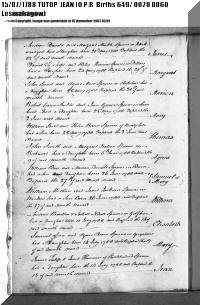 John and Janet’s son William (James Harvey’s uncle) was born in 1778 at Topenhall, as was their daughter Mary (1781). Given the fact that the Harvie family of Brownlee were land owners with some family members being clergy of the Church of Scotland, it is probable that John Harvie was a second son of a second son of gentry. 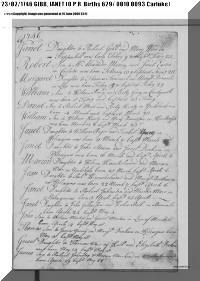 Linking John’s family to the landed gentry Harvie’s using birth records is not possible without local research. Inheritance law and social practice meant that the first son in a family inherited all. . 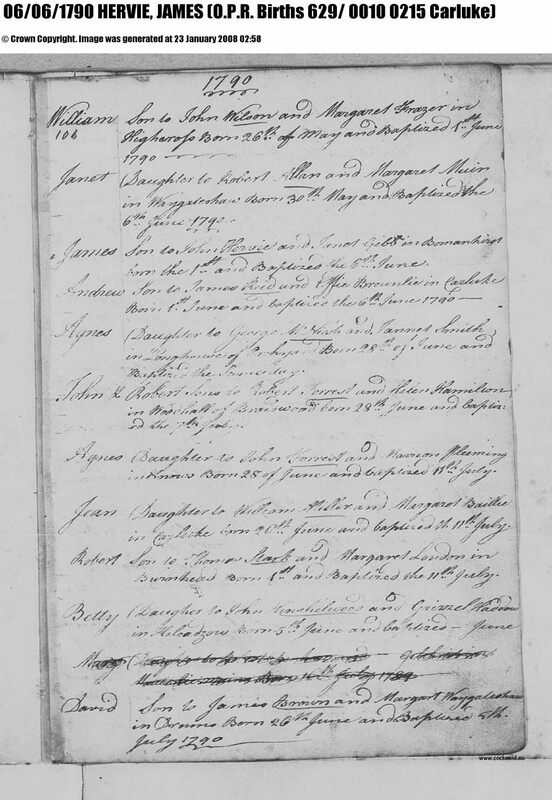 The Old Parish Records show Jean Tudhope was born in 14th July 1788 at a property called ‘Hutcheland’ in Lesmahagow parish), County Lanark to James Tutop and ‘Janet’ Thomson. Her dead certificate shows her mother’s name as Mary. 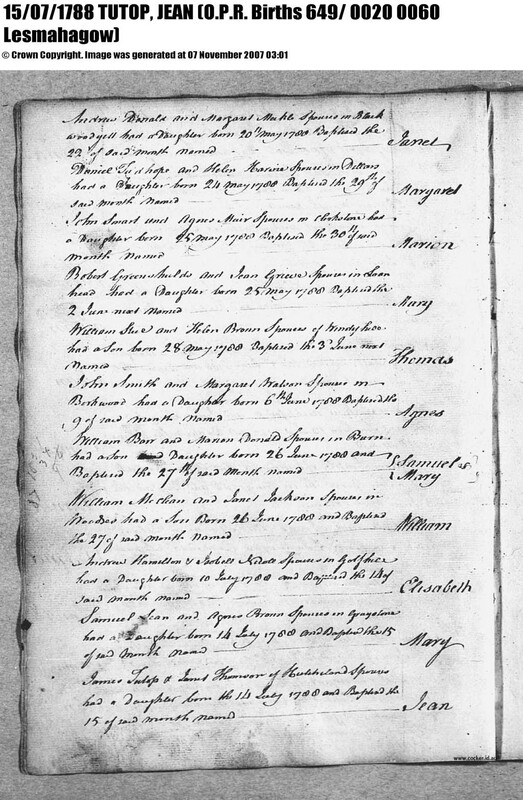 Thomson, as does the wedding record of James Tutop and Mary Thomson in 1769. Mary Thomson was born at Tanhill and tracing her family it appears she is the great great granddaughter of the martyr James Thomson, who died in the Convenanteers trouble in Southern Scotland in the period 1660 to 1689, when the monarchy was restored (The Restoration) after the Parliamentary Government lead by Oliver Cromwell was overthrown, at the battle of Drumclog (1 June 1679). James Tutop’s headstone shows he died in 1812, aged 74 and he was “of Hutchland”, a property south east of Lesmahagow. His wife Mary died in 1800. Antecedents of Jean’s Tutop family had been based in the Parish of Lesmahagow as far back as 1600. The family of Jean’s mother Mary Thomson farmed a property called Tanhill (I1 on the map) for over 350 years, up until 1779, in the Parish on the border with the Parish of Stonehouse. The family arrived at the property in 1630, from Perth, where John and James Thomsons alternate through the centuries back to the 13th century. James Tutop and Mary had 1 boy and 2 daughters, including Jean. 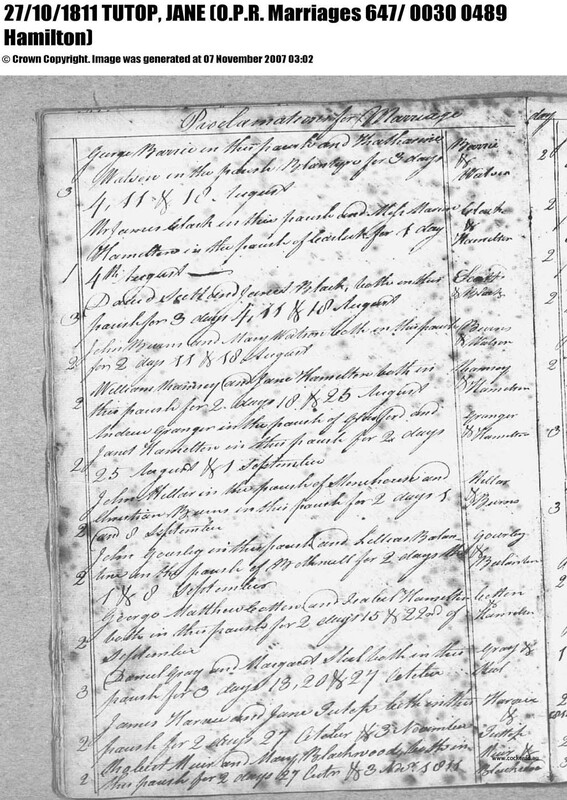 Their son George was a spirit dealer in Lesmahagow in the 1841 census. He died in July 1849 and his will records him as “of Hutchiland, vintner in Abbeygreen of Lesmahagow, spouse of Marion Donald.” The fact George was a businessman, and the property past from father to son indicates the family where ‘well- to do’ for the time. Together with her husband James’ family history, it probable the James and Jean Harvie were rural middle class from early on in their marriage. They were not agricultural labourers (as recorded in the 1841 census) in the usual sense. In the 1841 census, Jean and James Harvey senior lived on a property called Foulskyes, in the parish of Camnethan (also spelt Cambusnethan). 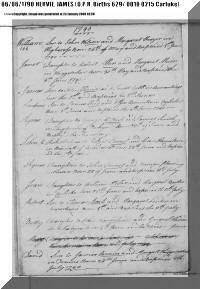 James’ occupation was recorded as an agricultural labourer – the same work his sons were doing. They had 4 children living with them– John (1819), Mary (1821), James and Jane (1829), all born at Meadowbank. A daughter Janet, born at Meadowhead in February 1824 was not living with the family in 1841. An eighth child Isabella was born in April 1834 at Meadowbank but she must have died as a young child, as she was not listed in the 1841 census. The two oldest children – Janet born in 1815 and Mary born in 1813 in “Wishawtown”, in the parish of Cambusnethan, must have died as children, as the names were used again by James and Jean to name children born later. His 1860 will records that he leased West Crindledyke Farm in 1848 from a Robert Sinclair Lockhart, 16th Baron of Castlehill and Cambusnethan. In 1851, James and Jean Tudhope are recorded as tenants farming a 90 acres property called Townheads in the parish of Cambusnethan and James junior was working as an agricultural labourer for his father. West Crindledyke Farm and Townhead presumably are the same property. Foulsdyke was not same property but certainly it was in the neighbourhood and was not a labourers’ croft as it is recorded on Thomson’s 1832 map. In 1841 and 1851 census the neighbouring properties appear in the same order. William Wilson, wife Janet Harvie and their children were also living on the property, with the census reporting them as living at Townhead. Daughters Mary and Jane were unmarried and living at home. West Crindledyke farm was probably the property Crindledyke Head on Thomson’s 1832 map. Later Ordnance maps (1858, 1885 and 1895) all show a farm called Crindledyke. James Harvie died 25th October 1860 on West Crindledyke Farm and is buried in Cambusnethan Old Churchyard. 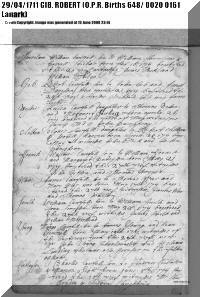 He died of “dropsy arising from chronic bronchitis.” In his will, he left the rights to the lease to his son in law William with the dairy cattle and farming utensils on the property. William had a personal bond with James for 350 pounds, indicating he was operating the farm before James’ death. James’ total estate was worth 582 pounds /6shillings and /11pence (several million Australian dollars today). He left Jean an annuity of 10 pounds per year. Jean’s death of “age” on the 26th February 1865 is saddened by the description of her as “Pauper Lunatic.” In the 1861 census, she was living with Mary in West Crindledyke Cottage, and, given her location at her death is unchanged it’s probable that she was living with family suffering from dementia or Alzheimer’s disease. Daughter Jane Hervie married a James Henderson before 1855 but died in January 1856 of ‘increased action and ulceration of the bowels’’. James Henderson was a witness to James Harvey’s marriage to Jane Brownlee in 1859. The oldest son John, in the 1851 census, was married to Frances (born in Maxton, Roxenburghshire in 1824), living in Beltonfoot, Wishaw, with two daughters, Jane (born 1843) and Francis (born 1850). 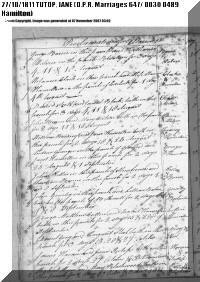 John’s occupation was a “carrier between Glasgow & Wishaw.” John died in the 1850 decade. 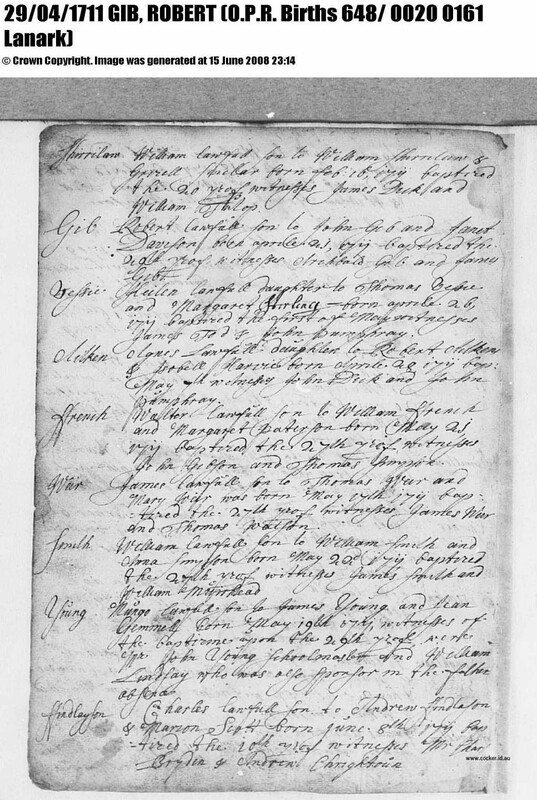 His father’s will records his death and confirmed his occupation at his death as carter. As there is no record of John’s death it was presumably between 1853 and 1855, before government recording started. In the 1861 census, Frances (recorded as Fanny) is the head of the family and a son, James, born in 1853, is living with his sister Fanny and mother. Interestingly Fanny had another daughter in the 1881 Census, Maggy born in 1865 in Wishaw. The older Fanny was a seamstress in this census and Maggy and her sister Fanny were domestic servants. Mary was living with her mother Jean Tudhope in the 1861 census but her surname showed that she had been married. She was a widow in 1861 with a son John Longmore, born in 1854. Her son was named after his father John Longmore (or Longmuir). No other records of Mary have been found. In the 1871 census son John was a carter living with his uncle in Carluke. He later married (Violet) and had a family that is traceable in Scottish census records. Janet married William Wilson (born 1813) in 1842 and he is recorded as the informant of the deaths of James and Jean Hervie. William and her husband farmed the inherited West Crindledyke Farm for many years as recorded in Census records (1861, 1871, 1881 and 1891) and had a large family. She died of hemiplegia in 1896. Her son John, who was informant on her death certificate, lived on Crindledyke Farm, Newmains. Two of William and Janet’s daughters also migrated to Australia. Their youngest Isabella (born 1865), just married to Adam Calderwood, and Mary (born 1857) and married to William Paton with two daughters, left Scotland in 1886. Descendants live in Melbourne. James Harvey, son of James Harvey (senior) and Jane Smellie, was born on 1 Jan 1855 in Cambusnethan, Lanark, Scotland and died on 1 Jul 1933 in Deloraine at age 78. Alexander Harvey was born on 22 Jun 1856 in Cambusnethan, Lanark, Scotland and died in 1933 at age 77. Mary Harvey was born on 13 Aug 1858 in Lanark, Scotland and died in Dec 1858 in Cambuslang, Lanarkshire, Scotland. Elizabeth Harvey was born on 14 Feb 1860 at sea on the Indiana from Scotland to Australia and died on 1 Jul 1939 in Mole Creek at age 79. Janet Harvey was born on 30 Aug 1861 in Westbury and died on 24 Apr 1886 in Hagley at age 24. Another name for Janet was Jane. John Norman Harvey was born on 4 Aug 1863 in Westbury and died on 16 Apr 1898 in Hagley at age 34. Thomas Harvey was born on 6 Sep 1865 in Westbury and died on 20 Oct 1909 in Latrobe at age 44. Mary Harvey was born on 3 Aug 1873 in Westbury. Norman Brownlee Harvey was born on 8 Jul 1881 in Westbury and died on 12 Mar 1882 in Westbury. George Brownlee Harvey was born on 4 Aug 1882 in Westbury and died on 8 Aug 1882 in Westbury. Mary Harvie was born on 14 Mar 1813 in Wishawtown, Lanark, Scotland and died before 1821 in Meadowbank, Dalziel, Lanark, Scorland. Janet Harvie was born in Jun 1815 in Wishawtown, Lanark, Scotland and died in 1822 in Meadowbank, Dalziel, Lanark, Scorland at age 7. John Harvie was born on 11 Aug 1819 in Meadowhead, Dalziel, Lanark, Scotland. Mary Harvie was born on 2 Nov 1821 in Meadowhead, Dalziel, Lanark, Scotland. Janet Harvie was born on 28 Feb 1824 in Meadowbank, Dalziel, Lanark, Scotland and died on 14 Apr 1896 in Cambusnethan, Lanark, Scotland at age 72. Jane Harvie was born on 3 Mar 1829 in Meadowhead, Dalziel, Lanark, Scotland and died on 12 Jan 1856 in Cambusnethan, Lanark, Scotland at age 26. Isabella Harvie was born on 6 Apr 1834 in Meadowbank, Dalziel, Lanark, Scotland and died before 1841 in Lanark, Scotland. William Harvie was born in 1778 in Tappenhill, Parish of Carluke, Lanark, Scotland. Mary Harvie was born on 9 Feb 1783 in Lanark, Scotland. Isobel Harvie was born on 4 Nov 1786 in Tappenhill, Parish of Carluke, Lanark, Scotland. Mary Harvie was born on 18 Feb 1871 in Lanark, Scotland and died before 1873. George Tutop was born on 18 Apr 1770 in Lesmahagow, Lanark, Scotland and died on 4 Jul 1849 in Lesmahagow, Lanark, Scotland at age 79. Isobell Tutop was born on 10 Apr 1774 in Lesmahagow, Lanark, Scotland. Tutop was born on 10 Jan 1784 in Lesmahagow, Lanark, Scotland. Mary Gibb was born in 1743 in Parish of Carluke, Lanark, Scotland. Lilias Gibb was born in 1748 in Parish of Carluke, Lanark, Scotland. Isobel Gibb was born in 1752 in Parish of Carluke, Lanark, Scotland.